Wondering how my brain works when it comes to decorating? Well, it usually starts with color. Color is the #1 way I am inspired and it's usually the colors of nature. 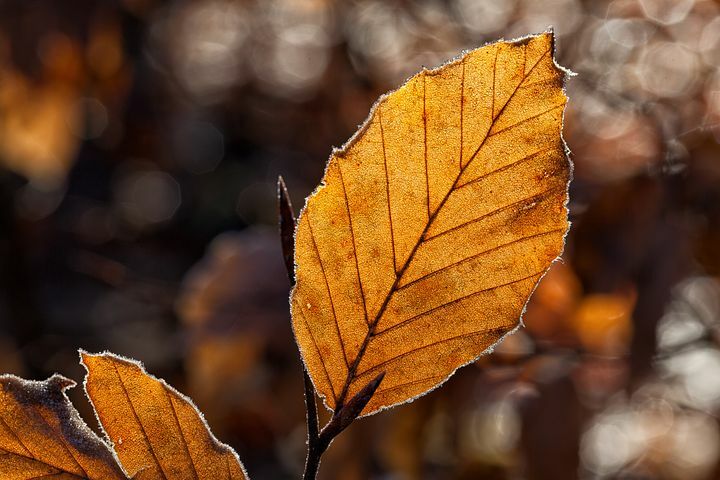 This fall season I was inspired by the hue of dried leaves, warm woods, black leather and a favorite grey sweater. Color is most important in my decor process because it's what ties everything together. The color story that I pick will help make sense of another component in decorating which is the "feeling" or "mood" of the room. What do I want my room to feel like? For this season I wanted my room to feel warm, quiet and inviting. I wanted it to feel a bit heavier, enveloping and more saturated than Spring and Summer. I wanted my home to have a warm glow in the evening with candlelight. (OK, I'm starting to sound a bit cheesy, but seriously that is how my brain works). This picture is from when I created an indoor picnic in my living room last year and you can see it HERE. After I make sense of the colors and mood of a room, I start to think of the finishes and textures that I want to incorporate in my decor. 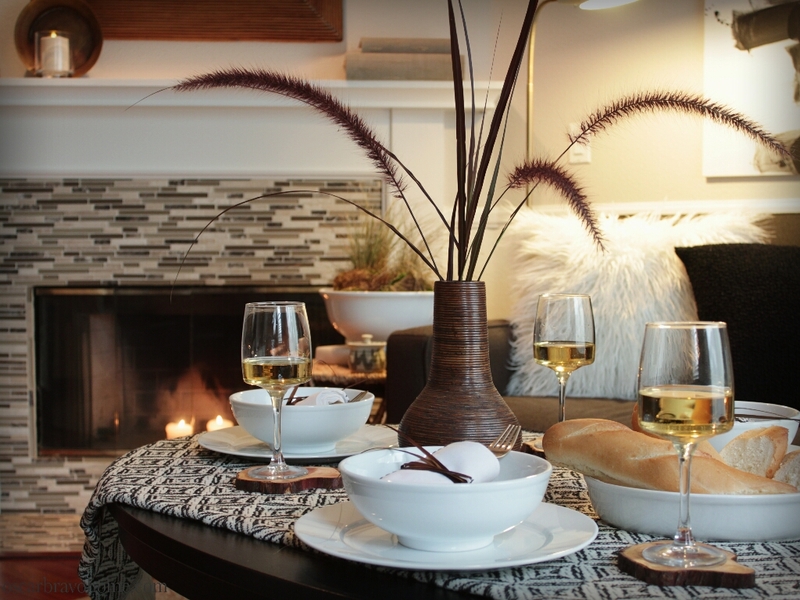 What textures, shapes, and even smells will enhance the MOOD of the room? 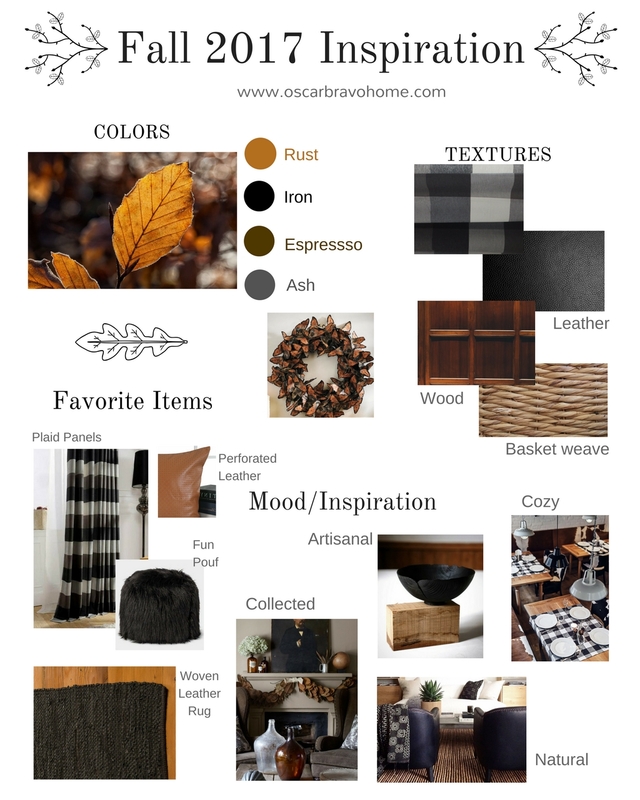 For Autumn, I wanted earthy and masculine finishes like leather and wood. I wanted a mix of smooth leathers, nubby fabrics and woven accents. To understand what I'm going for I created a mood board. I encourage you to do the same whenever you're planning a space. A mood board (or inspiration board) will definitely help you stay focused on achieving the look you are going for. Love the warm color palette. I am enjoying my visit.